On March 30, key activists met with President Obama and his Special Envoy for Sudan, Major General Scott Gration, in the West Wing of the White House. President Obama made it clear that his administration would work vigorously to bring an end to the war in Darfur and help implement the Comprehensive Peace Agreement (CPA) between the North and South. After extensive consultations with members of President Obama’s team, UN officials, diplomats from other key countries, and Sudanese actors, this paper is an attempt to put forward a blueprint to achieve President Obama’s objective of a comprehensive peace for all of Sudan. The good news is that this is a goal shared widely throughout the international community. The key missing ingredient for its achievement is strategic leadership from the United States. In this paper we lay out the structures we think are necessary to achieve peace in Darfur and implement it in the South, East, and transitional zones between the North and South, all areas of active or potential conflict. We also lay out a set of focused and meaningful sticks and carrots necessary to leverage the various parties to find a peaceful solution to the interlocking conflicts within Sudan and regionally. 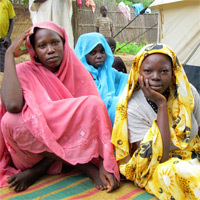 In Darfur, the expulsion of key humanitarian aid groups and closure of Sudanese aid organizations have created increasingly precarious conditions for the 2.7 million internally displaced camp dwellers, although some arrangement to expedite the resumption of some aid operations appears to be pending. Brutal harassment of Sudanese human rights defenders has silenced internal voices of dissent. President Omar el-Bashir’s use of starvation as a weapon of war is an attempt to distract the world from the real issues of accountability in Darfur, the elections in Sudan early next year and the implementation of the CPA. The Government of Sudan should face clear costs from the international community for so blatantly abrogating its responsibility to protect its own population. In the South, there is a mere one year and nine months left before the scheduled date for an independence referendum, and implementation of the Comprehensive Peace Agreement, or CPA, is grinding to a halt on key benchmarks. Meanwhile, localized violence demonstrates both the South’s institutional fragility and vulnerability to traditional divide-and-conquer strategies directed from Khartoum. If left unchallenged, Bashir will continue to view efforts to foment violence, instability, and displacement in the South and Darfur as his most effective instruments of control. Bashir’s use of proxy militias (the Janjaweed in Darfur, the Murahaliin in North-South border areas, and other militias throughout the South) has served as an effective means for him to maintain power in Khartoum, but it has also unleashed the centrifugal forces that could violently rip Sudan apart. President Obama must be firm in responding to the impending humanitarian crisis, promoting protection of civilians and accountability, and working toward a viable long-term peace that includes both Darfur and a reinvigorated CPA. If the expulsion of key groups from Darfur and elsewhere was suddenly lifted by Khartoum, the situation on the ground would improve greatly. But the essential dynamics of the situation would remain unacceptable — with no clear peace process for Darfur, the CPA fraying, UNAMID ineffective, civilians desperately vulnerable, and President Bashir still a wanted fugitive from international justice. Here’s the opportunity: a global consensus exists for peace in Sudan, even if there is not agreement on the best path to achieve this goal. China, the Arab League, the African Union, the European Union, and the United States all want peace, but little has been done to build the necessary infrastructure to help bring it about. What has long been missing in Sudan is America’s strategic leadership. The rebels, the ruling party, Sudan’s neighbors, and other key actors have all been waiting for President Obama and his team to engage. The CPA itself was reached after a sustained investment in diplomacy, led in part by the United States, supported by relevant regional and international powers, and backed by significant incentives and pressures. That hard-won agreement would not now be in jeopardy if the investment in diplomacy had been maintained and the international community had continued its pressure to ensure that the agreement was implemented. It is not too late for the United States to re-invest in ensuring that the outstanding issues preventing full implementation of the CPA are addressed, and the Obama administration must take these steps or watch the possible violent disintegration of Sudan and destabilization of the broader region over the next several years. The Obama administration must lead in constructing a multilateral strategy for peace by establishing an inclusive peace process for Darfur, re-vitalizing implementation of the CPA and the dangerously neglected Eastern Sudan Peace Agreement, and ending Sudan’s proxy war with Chad. Toward that end, General Gration should focus on building a multilateral coalition of countries with significant leverage. At the same time as the processes are being constructed, the United States should work assiduously to create the necessary unilateral and multilateral carrots and sticks to press the parties in the direction of a peaceful and comprehensive settlement of Sudan’s multiple, interlocking conflicts. It is vital that the administration work closely with other key governments in dealing with Sudan; a reliance on bilateral diplomacy will provide Khartoum the opportunity to play one party off against the other, as it has historically done with great success. Darfur peace process: The structure should be similar to the Naivasha talks that produced the CPA, and some of the ingredients are already in place. As did Kenyan General Lazaro Sumbeiywo with the Naivasha process, AU/UN mediator Djibril Bassolé should lead the Darfur process, which can be based in Doha, Qatar (although Qatar’s recent diplomatic support for Bashir in the wake of the ICC indictment has impaired its credibility as a facilitator of negotiations). He must be supported by a strong team of diplomats and regional experts and backed by a small group of countries with leverage, high-level support, and full-time representation at the talks. We believe that this inner circle should consist at a minimum of the US, UK, France, China, and Egypt. An outer circle group of countries and multilateral organizations (UN, AU, Arab League) should also be engaged in a formal manner to discourage spoilers, and other key nations such as Russia, Saudi Arabia, Senegal, South Africa would need to be thoroughly consulted. CPA implementation: The Assessment and Evaluation Commission established by the CPA is clearly insufficient to monitor and press the parties to implement the deal (largely because it lacks sufficiently senior representation and clear reporting guidelines). As a matter of international peace and security, CPA implementation should be at the forefront of the U.N. Security Council’s agenda and the Council should back a new ad-hoc mechanism to guide implementation. The Obama administration should quickly work with other Security Council members, relevant U.N. agencies, and the regional Intergovernmental Authority on Development, or IGAD, to establish core benchmarks for the parties, a clear timeline, and genuine penalties for failure to meet deadlines. An international meeting on CPA implementation could provide a vehicle for reenergizing efforts around the CPA and provide the launching pad for the creation of the ad-hoc implementation mechanism. Chad/Sudan peace process: The Sudanese government continues to seek a military solution for Darfur through regime change in Chad, and Chad continues to back the JEM in response. The Obama administration should work with France and China to support high-level negotiations in Libya aimed at reducing state support for foreign armed groups and eventual normalization of relations. Eastern Sudan Peace Agreement monitoring: Eastern Sudan remains volatile. The Obama administration should work with its international partners (particularly the UK and Norway) and with the Eritrean and Saudi governments to establish a monitoring group for the agreement that will report on implementation and make recommendations for improvements. A serious peace process with credible mediation putting forward fair proposals will secure a deal for Darfur. A competent and higher level oversight mechanism with the involvement of countries with influence will ensure the implementation of the CPA. Having the right balance of meaningful pressures and incentives will ensure that prospects for success are much greater. Behind Door One: if the Sudanese government permits unimpeded humanitarian access, removes the indicted president, and secures peace in Darfur and the South, a clear process toward normalization will be mapped out. Almost all of the incentives for Sudan come in the form of more normal relations with much of the world, the lifting of sanctions, a return to more normal patterns of trade and diplomacy, and the other benefits that would naturally flow from Sudan achieving stability as a result of more equitable power and wealth sharing. Behind Door Two: if President Bashir and his party remain defiant by continuing to undermine efforts at peace for the country, a series of escalating costs will ensue, including diplomatic isolation, targeted economic sanctions, an effective and expanded arms embargo, and, if necessary to stop massive loss of civilian life, eventual targeted military action. If the benefits of Door One and the consequences of Door Two are meaningful, the chance for peace in Sudan increases dramatically. The missing ingredients in efforts to date for Darfur and CPA implementation have been adequate leverage and lack of strategic vision for resolving comprehensively the country’s conflicts. Without real sticks and carrots, the warring parties in Sudan will remain focused on military confrontation. The international community needs to help change the incentive structure in Sudan from war to peace. On the incentive side, phased cooperation with and—ultimately—normalization with the United States is the largest carrot the Obama administration has to offer. Removal of certain unilateral sanctions and penalties could be undertaken in response to verifiable changes on the ground in Darfur and the South. Full normalization should only occur once the Sudanese government adheres to its obligations under various peace agreements. Any negotiating process must be guided by the reality that Khartoum has a long history of grabbing carrots, then failing to follow through on commitments. On the pressures side, there seems to be an erroneous belief that there are no meaningful pressures left to use. We have spelled out a number of points of leverage that are available. That reflects our view that the Sudanese government responds much more directly to pressures than they do to incentives. Until now, most sticks have been unilateral and have had limited effect on the regime’s calculations. Substantial and focused multilateral pressures have not been tried and should form the basis of the new administration’s strategy. Clearly, equally robust pressures and incentives should be developed and applied impartially to the rebel factions and SPLM to the degree to which their actions may warrant these measures. We believe leverage for peace in Sudan can best come from the following actions. Some of these initiatives should occur immediately to build leverage for negotiations, while others should be utilized only if the situation in Darfur deteriorates as a result of ruling party actions or intransigence. Isolate Bashir: Although Bashir is experiencing a short-term surge in support from Arab and African governments in the aftermath of the arrest warrant, this will erode quickly in the face of longer term trends that include his use of starvation as a weapon, continuing support for Hamas, and Khartoum’s warmongering, which puts Chinese and Arab investments at risk. Private diplomacy can explore ending Bashir’s tenure and finally addressing the impunity that has reigned throughout his two decades in power. There are already telling signs that support for Bashir in key Arab and African states is more rhetorical than practical, with a number of senior leaders increasingly seeing him as a distinct liability. Bashir’s actions are making Sudan’s fragmentation more likely, not less, and that is an outcome that key players in the region should hope to avoid. Personal and direct diplomacy by President Obama will be crucial in shaping regional attitudes toward Bashir. Reinforce the Government of Southern Sudan: The main deterrent to the resumption of war between the ruling party and the South is a strong GOSS. That requires investing in good governance, anti-corruption measures, agricultural production, and the modernization of the South’s army (the SPLA). This includes providing the air defense system that President Bush promised to the GOSS well over a year ago in order to neutralize the ruling party’s one military advantage: air superiority. Support the elections and referendum: The national elections recently re-scheduled for 2010 and the 2011 referendum could trigger a return to war in the South if they are unilaterally undermined by the ruling National Congress Party. International support should be directed to holding fair and transparent processes that allow the Sudanese people to choose their leaders and decide their fate. Sudan’s multiple crises all stem from a failure to establish reasonable power-sharing mechanisms in this large and incredibly diverse country, and a great deal of attention needs to be put into ensuring that elections can be conducted in an environment of safety and security. End simmering regional conflicts: Conflicts and rivalries throughout the broader region of East and Central Africa make it much harder to resolve Sudan’s internal wars. Multilateral efforts should focus chiefly on the simmering conflicts between Ethiopia and Eritrea, on ending the threat posed by the Lord’s Resistance Army, and on ending Chad’s destabilizing civil war. Re-contextualize counter-terrorism cooperation: Khartoum has for years used its cooperation with the United States on counter-terrorism to deflect serious pressure over human rights and implementation of the CPA. Consistent with its stated policy, the Obama administration must make clear to the Sudanese government that cooperation on counter-terrorism is not a chit it can trade for U.S. compromises on human rights and peace efforts. Secure the support of key diplomatic players: As stated above, some of Bashir’s staunchest supporters have new reasons to back away slowly from their despotic ally. If the CPA collapses and the North-South war resumes, China and Egypt would be among the biggest losers. Former southern rebel commanders indicate that if they are forced to go back to war, the first targets they will hit will be Chinese oil installations. And if they go back to war, some of the southerners will fight for independence this time, rather than their previous vision of unity, and previous divisions within southern communities would likely be stoked in a violent fashion by Khartoum. Egypt’s worst fears of a potentially hostile new state in the Nile Basin could be realized. These two countries, along with key African countries, Saudi Arabia and other Arab League states, should be engaged to become part of the solution in Darfur and the South. President Obama should also make clear to relevant nations that ending blind support for Bashir to the detriment of the peace process is a priority for his Administration and has the potential to affect bilateral relations with the U.S. if not addressed. Military planning: Military planning should begin to develop ways to ensure delivery of humanitarian aid if the regime continues to deny aid as a weapon of war. It would be irresponsible not to prepare for worst case scenarios. Strengthen multilateral, targeted economic pressures: President Obama should work through the U.N. Security Council to bring on board a larger collection of nations with targeted sanctions against those individuals and parties most responsible for violence in Sudan, whether they are government or rebel actors. If the Security Council fails to pass these broader sanctions, then the U.S. should build an international coalition to bring this pressure, working particularly with the European Union, individual European countries and Japan. Along with the ICC, these instruments can create much higher legal, financial, and political costs to those who are responsible for violence against civilians and preventing progress toward peace. Expand the arms embargo: Given the Sudanese government’s continued attacks against civilians in Darfur and compelling evidence that weapons from other nations, including China, are finding their way to the frontlines, a comprehensive arms embargo on offensive weapons against the Bashir regime should be imposed by the U.N. Security Council. The embargo should include a robust international monitoring mechanism to ensure its effectiveness. Protect civilians: UNAMID is failing to achieve its central goal of protecting the civilian population in the region, but the question of how to bolster UNAMID’s ability to protect civilians seems to have fallen off the international community’s radar screen in recent months. Much of this failure can be traced directly to the practice of giving the Sudanese government—the prime perpetrator of the genocide—a de facto veto over the mission’s composition and operations. This has to change. A robust force on the ground in Darfur with a competent lead nation, an experienced division-level headquarters staff, and a clear command-and-control structure is essential for saving lives, creating an environment amenable to the peace surge, and establishing the international credibility required to ensure that a broader peace strategy succeeds. Galvanizing the political will necessary to build this capacity could finally give UNAMID a chance to succeed in protecting civilians. The effort to fully staff the U.N. force in Darfur at 26,000 should be accompanied by a shift in the U.N. force’s mandate that would allow it to protect civilians who want to go home to their villages of origin, which should be the ultimate goal of our Darfur policy. Effectively end offensive military flights: President Obama and other key members of the administration have taken a robust position in the past regarding the need to counter Sudan’s aerial attacks on civilians in Darfur, and have voiced support for enforcing a no-fly zone. Continued Sudanese aerial attacks in Darfur—there were over 40 last year—have rightly generated considerable attention, as has the expulsion of key relief agencies. The U.N. Security Council has demanded an end to offensive military flights several times, most recently in Resolution 1769, which authorized UNAMID. UNAMID has not enforced that demand. It is clear that the administration and the U.N. Security Council need to consider how best to counter these continuing aerial attacks. President Obama and members of his administration have spoken passionately about their intention to act boldly to end the crisis in Darfur and promote international efforts toward a peaceful future in Sudan. Now they have the chance to do so at a crucial juncture in Sudan’s history. But the United States can’t do it alone, and the Obama administration’s engagement and close coordination with other key governments is essential. Special Envoy Gration can lead U.S. efforts toward peace in Sudan, but he must recognize the need to work closely both with U.S. allies and with those leaders who continue to back Bashir following the ICC arrest warrant issuance. President Obama should now begin stronger and more sustained efforts to build a coalition for peace. But this effort will only be successful if the President himself treats the situation in Sudan as a strategic priority, sets objectives for U.S. policy, builds the necessary leverage, and invests in the diplomacy necessary to achieve an equitable and lasting solution.